NEITHER WILL THEY BE PERSUADED IF SOMEONE SHOULD RISE FROM THE DEAD. This Sunday's readings continue the theme from last Sunday of warnings to those who profit at the expense of others. 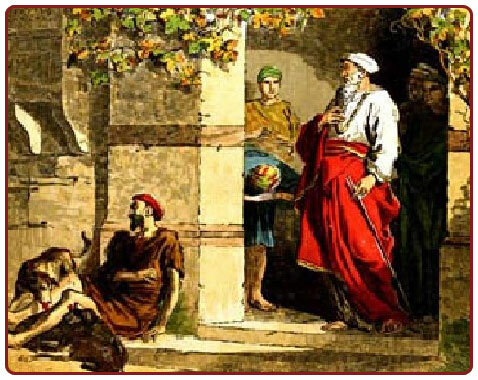 Our first reading this week (Amos 6:1,4-7) actually preceded last week's reading from the Prophet Amos wherein the prophet proclaimed God's warning, "Never will I forget a thing they have done!" This week's reading adds a blunt warning of woe. "Thus says the LORD the God of hosts: Woe to the complacent in Zion! Lying upon beds of ivory, stretched comfortably on their couches, they eat lambs taken from the flock, and calves from the stall! Improvising to the music of the harp, like David, they devise their own accompaniment. They drink wine from bowls and anoint themselves with the best oils; yet they are not made ill by the collapse of Joseph! Therefore, now they shall be the first to go into exile, and their wanton revelry shall be done away with." Our Gospel reading (Luke 16:19-31) builds on this theme and brings it to its natural conclusion - the consequences of such a life of indifference to the poor. In closing, Jesus made a veiled reference to himself after his resurrection in saying, "neither will they be persuaded if someone were to rise from the dead." "Abraham replied, 'My child, remember that you received what was good during your lifetime while Lazarus likewise received what was bad; but now he is comforted here, whereas you are tormented. Moreover, between us and you a great chasm is established to prevent anyone from crossing who might wish to go from our side to yours or from your side to ours.' He said, 'Then I beg you, father, send him to my father's house, for I have five brothers, so that he may warn them, lest they too come to this place of torment.' But Abraham replied, 'They have Moses and the prophets. Let them listen to them.' He said, 'Oh no, father Abraham, but if someone from the dead goes to them, they will repent.' Then Abraham said, 'If they will not listen to Moses and the prophets, neither will they be persuaded if someone should rise from the dead.'" In our Epistle reading from St. Paul's first letter to Timothy (6:11-16), we hear how we are to live our lives, in stark contract to the characters in the first reading and Gospel. St. Paul always gives us concrete instruction and examples of how we are to live in Christ. "But you, man of God, pursue righteousness, devotion, faith, love, patience, and gentleness. Compete well for the faith. Lay hold of eternal life, to which you were called when you made the noble confession in the presence of many witnesses. I charge you before God, who gives life to all things, and before Christ Jesus, who gave testimony under Pontius Pilate for the noble confession, to keep the commandment without stain or reproach until the appearance of our Lord Jesus Christ that the blessed and only ruler will make manifest at the proper time, the King of kings and Lord of lords, who alone has immortality, who dwells in unapproachable light, and whom no human being has seen or can see. To him be honor and eternal power. Amen." It is not evil to be rich, but it is a different matter for those who spend their wealth exclusively on themselves and do not share their gifts (monetary and otherwise) with others, especially those less fortunate. How do we handle our gifts and our wealth? Will we be persuaded by he who rose from the dead?